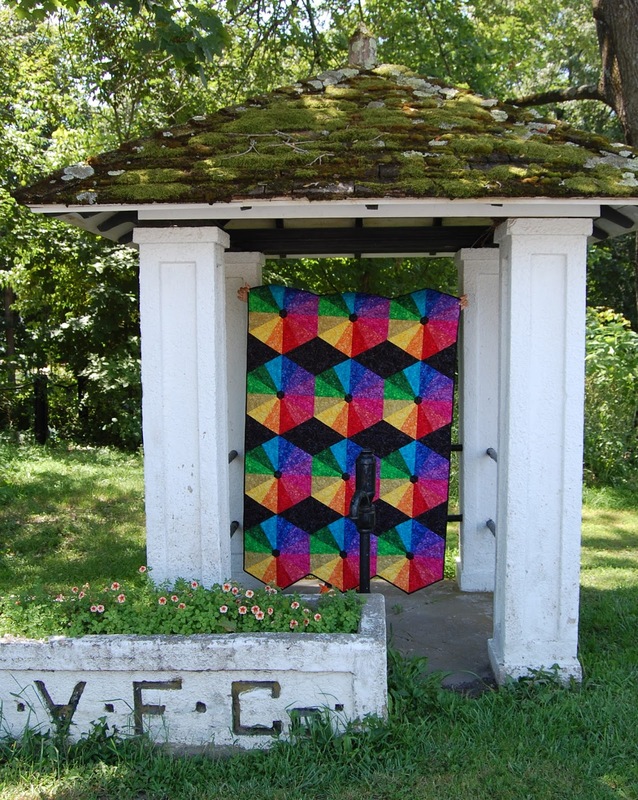 heather kojan quilts: Jaftex Blog Hop Day Six - And a Giveaway! Welcome to day six of the month long Jaftex blog hop! Never heard of Jaftex? It's the parent company of some of my favorite fabrics: Sudioe, Blank Quilting and Henry Glass fabrics. 30 bloggers were given a bundle of fabric with the directions: make something. Easy enough! 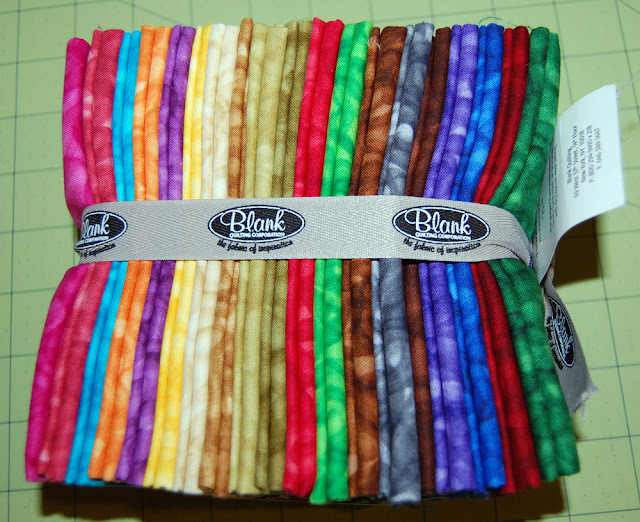 This is the bundle I received from the Fusion Illusion line from Blank Quilting. As soon as I saw the bundle I started thinking of a rainbow quilt. And since I'm on a bit of a wedge kick right now, I decided to combine the two. A little grainy. My photographer neglected to take any close ups. Here's a better photo. Ignore the water pump in the foreground. Here's a close up of the quilting. My guild-mates from the Baltimore Modern Quilt Guild will be shocked that I chose variegated thread! Quilted by Maria O'Haver. This quilt came together really quickly! I really love the results. I'm thinking of writing it up as a pattern. If you're interested, be sure to sign up for my newsletter on the side bar. You'll be the first to know when it's ready. So, on to the giveaway! Would you like to win a bundle of Fusion Illusion? Here are all the stops on the blog hop! Be sure to see Kim Diehl's post from day one on American Patchwork &Quilting. The next stop is another Heather: Heather Mulder! Have fun and happy hopping! Beautiful quilt! I have always loved Blank Quiltings fabrics. They have a great "feel" to them. Whoops! For got to say what I would make. 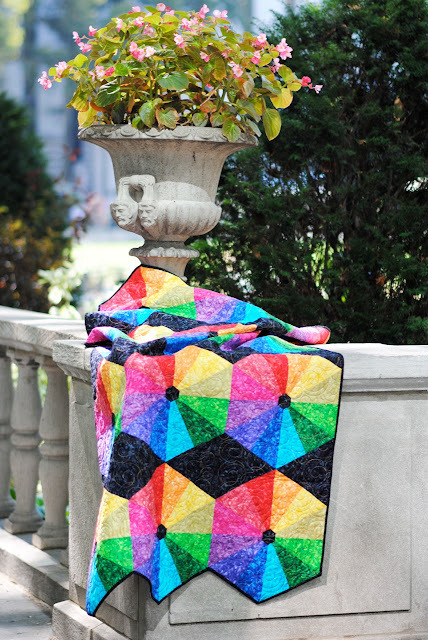 I am looking for brights to make a pieced Hexie quilt. These would really add to the look of it. I would make a quilt with pinwheels. How about for us Canadians, we pay for the shipping if we win the fabric bundle? I'd make a quilt! Love this pattern. I follow you on Instagram. Thanks for the giveaway. I'd make your Roy quilt as soon as that pattern is up! Thanks for the chance. I'd made a rainbow quilt also. Thanks for the giveaway! I would make a rainbow star quilt. I am really low on solids and would love to use this on some quilts on my list. I would love to make a quilt like your Roy quilt, with that FQ bundle! So striking! I hope you do write the pattern, that's what I would use the stack for. Your quilt is beautiful. I am sure it would be a quilt. The thing asked for favorite quilt shop - there are none near me. Love the quilt, yes you need to make a pattern for it. I would make a lap sized quilt or a quillow. Thank you for the inspiration. I am a new follower on Facebook. Thanks! Omg that fabric is gorgeous, esp with the black backround. Hope you do make the pattern, I'd love that & the fabric!! This fabric is beautiful. I would be adding the fabric to my stash of batiks for a project that as of right now I don't know what it is. :) Thanks for the great giveaway. Your rainbow quilt is absolutely gorgeous! I would love to make a similar quilt with this gorgeous fabric. I hope you make the pattern! Thanks so much for sharing this, and thanks for the chance to win. I'm following you on Instagram (pksolberg). Thanks again! I would make a. Quilt. I would use the EPP too.because that's what I'm learning now! Just purchased an applique shoe quilt pattern. These bright fabrics would be great for the shoes on a dark background. I have yet to make a rainbow quilt, but I'd also be tempted to break up the bundle and just add the fabrics to my quilts when needed. Love your quilt. If I'm lucky enough to win, I'd make a lap .quilt for my youngest sister. Thanks. If I won this beautiful bundle, I would like to try out my new Dresden Plate ruler, to make something similar to your beautiful quilt. Your quilt is beautiful. I think I would use these rainbow colors in a log cabin quilt. Love your quilt! The fabrics are lovely... I'm thinking Modern, too. Make a new lap quilt! Gorgeous quilt! I've been wanting to make a large color wheel wall hanging for my quilt room and that sweet little bundle would be just perfect! Absolutely stunning and I love the name Roy for it! I immediately thought of rainbows too when I saw the bundle. I would use these gorgeous fabrics to make a baby's rainbow quilt. I love baby quilts that use strong, bold colors. These fit the bill perfectly! Love the quilt. I think I would make a double cut 4 patch quilt. I love colorful applique quilts. I would use these in one of the upcoming BOM's for 2016! Such a cheerful bundle. Think I'd make a rainbow wedge (dresden plate) quilt for my daughter. Not sure what colour I'd "float" it on yet. Love your quilt. I think I will have to wait till you write up the pattern. If I win, I would use those fabrics, otherwise I will have to dig into my stash and use those. New to following you on Facebook. I just wanted to say how lovely this quilt is! My favorite so far in the blog hop. Quilting Essentials in Roanoke, VA! I's like to make a stained glass quilt! Oh huh, what would I make???? Not quite sure yet, but love your nod to Roy G. Biv! I would love to win this bundle of fabric and make your quilt! It's gorgeous. I signed to follow you on FB. I'm making lots of pillow cases these day for kids in the hospital. These bright colors are terrific. Those are so pretty. I'm making a Dresden Squared quilt for a sparky three year old niece, and I think she would love these to be included in her quilt. I would make a quilt with the material. I would most likely make a baby quilt--there are four babies coming (that I know of so far) that need quilts. Yikes! Your quilt is breathtaking. I would use the fabrics for a quilt, too. Thank you for the giveaway. I would make a rainbow quilt... A new venture for me! I am following you on Instagram. Thank you. Heather, you don't have to include me in this giveaway (since I am one of the bloggers, too, with the same fabric), but I just wanted to tell you that your quilt is AWESOME! When I first got my fabric, I was thinking of a rainbow quilt, too, but then I worried about what pattern to use or if I should make my own. Yours is phenomenal!I LOVE it! Wow, the quilt and the fabrics are amazing! Should I be lucky enough to win, I would use these fabrics for a lap quilt or mix them with other fabrics for several lap quilts. I'm making a big stack for Christmas and these fabrics would lead to lovely gifts. Thanks for the chance to win. Hi, I'd love to make a new Throw! Thanks loads! Sent Request for following on FB! I would make my youngest daughter a quilt. Haven't made her a quilt yet and it is on my list. Wow! That quilt is gorgeous. I'd use the fabrics to finish off my NY Beauty blocks. My 9 year old niece loves rainbow anything and would make her a quilt! Your quilt is gorgeous. If I won the fabric, I want to make your quilt. I love your quilt Roy. Excellent layout to show off the colors. With those awesome colors I'd make a throw for my living room to brighten it up. I can think of a few patterns I'd like to try with it, they're so gorgeous! Following you on Instagram and Facebook, I'm tickled about that too. This is my first Blog Hop so I get to learn so much about everyone. 😊thank you! What a gorgeous bundle of fabrics! I would most likely make a quilt, but a different type of rainbow effect, starting at one end and transitioning through the color wheel to the other side. Thanks for sharing the giveaway. I don't do social media, so I follow you only by email. Thanks for a great giveaway. The fabrics are beautiful! Gorgeous fabric!!! A quilt, always a quilt!!! Love rainbow quilts, just haven't found the "right" fabric yet...but this just may be it!!! Farm Quilting follows you on FB and farm_quilting follows you in IG. Hi Heather. LOVE the wedge quilt. Super cute. I would do some English paper piecing if I won the bundle. I'd make a quilt ,of course! I would like to make a lap quilt or table runner. I need to make a baby quilt for a new great grand niece/nephew. A rainbow quilt would be perfect! I'd make a quilt for my daughter. It's beautiful fabric. I'd make a quilt for one of my grandkids. Not exactly sure what I'd make, but it would go in my stash for future quilts! LOVE the bright colors set off by black! Beautiful fabric. Love your quilt. Maybe I would make a table topper. What a fun rainbow quilt. Love it. And the fabric. Thanks. Your quilt is lovely! I love to have fabrics like these to use in my scrappy quilts. They work great paired with other fabrics in my stash. Thanks! I love these! I think I might have to copy your quilt if I won! Gosh, it's pretty! I love the bundle! Your quilt is gorgeous, and I would love to make a rainbow quilt of some kind. I follow you on FB. This is a beautiful bunch of fabric. I love your quilt. I would probably make a Butterfly Blooms. A favorite pattern of mine. I follow on FB, separate comment. Love the fabric and your quilt design! In fact, if the pattern emerges that is what I would likely do with the fabric. I now follow you on both Facebook and Instagram!! I love the Rainbow quilt! Such pretty fabrics for the great design. Happy quilting. I love the rainbow pattern ROY and the fabric has wonderful color. Oh, I love your quilt! If I won this bundle, I'd make a beautiful bright and cheery community quilt. My last name is Roy. Ha! I never made the ROY color connection. Aren't you clever! Love your Roy quilt. I would make a quilt. If I could win this bundle, I would make a quilt, of course! Such a fantastic rainbow quilt! Ooh, love those colors and yes, you should write up the pattern. What an amazing bundle of bright beautiful colors. I love your design! I'd love to make a quilt for one of my nieces. Thanks! What a gorgeous quilt, and I love looking at the backgrounds/settings in your photos. There must be a story behind that variegated thread! If I won the fabric, I would certainly be making a cheery lap quilt for a friend who needs a lift, and these rainbow colors would be just the ticket. Wonderful colors. I would make something tropical with these fabrics. Love your quilt,and rainbows are my favorite! I would love to make a quilt. I love the colors. Just lovely Colors and a stunning quilt. I would make a lap quilt and a bag. What do you think about using the Winding Way pattern? Your quilt is fantastic and I love the color saturation on this bundle! My daughter is to be married in two years and she and her fiancé love rainbow colors and this would be perfect for their Wedding Ring Quilt! These are some great blender fabrics! I'm planning to join a guild this Fall and they're hosting a Rainbow quilt exhibit at a festival next year so if I won these the fabrics would go toward making a project for that. Now I need to start thinking about what pattern I'd use just in case I win! I really like that quilt Heather. I would love it as a pattern. I follow you on InstaGram. A chevron quilt in rainbow colors would be my choice of design. I will follow you on Facebk. I would branch out and attempt the Prism Modern Quilt that I saw on Craftsy. I like the way you used the fabric. I'd like to try a wall hanging using the bundle. Would I like to win a bundle of Fusion Illusion???? Would I ever!!!!! Brights are my absolute favorites. Love what you did with them. This fabric is so beautiful and every project I've seen with it is super. I'm probably use it making a quilt or wall hanging since those are what I usually make. Thank you. I like your project and you should certainly write a pattern. I would use the fabric bundle to make a quilt (throw size) very similar to yours! I'd make a string quilt, maybe give it to my local cancer center for a chemo patient. I would make a quilt with ithis fabric and your rainbow quilt is great inspiration. Thanks for sharing and for the giveaway. I follow you on Instagram now as Ceciliaquilts. I would make some lovely tote bags with this fabric. I would incorporate those fabrics into my stash, to be enjoyed, used, discovered for a long time! A quilt, love your quilt! I love your quilt and it's name! If I win this bundle I'd make a quilt. Thanks for the chance to win! The bundle of fabric is beautiful and your quilt turned out great! It's always so hard to say what I'd make until I play around with the fabrics! Our guild theme this year is the color wheel, I haven't made mine yet. This might be the boost I need. These fabrics would make a colorful gift for a charity! I sent you a friend request on FB. Thanks again! Love this bundle of fabrics and absolutely love your quilt. I love your quilt and that is what I would make if I won the fabric once the pattern is available. If I won the bundle I would make a quilt once the pattern is released. Love it and the eye pleasing colors. I'm not only following you on Instagram now but signed up for your newsletter. I would use these fabrics for my doll sewing for the FLUFF Project! Thanks for the chance! MY LQS is Atlantic Fabrics. I love this rainbow quilt...awesome job!!! I'd add it to the t-shirt quilt I'm making for my grandson. Such happy colors! Striking Quilt! I would add to batiks and appliqué or make a star burst. Roy is gorgeous! I love the name too! I would probably ooh and ahh over fusion for a while and then find just the right project. I'm planning quilts for my brothers and could see those colors in them! Pretty pretty! 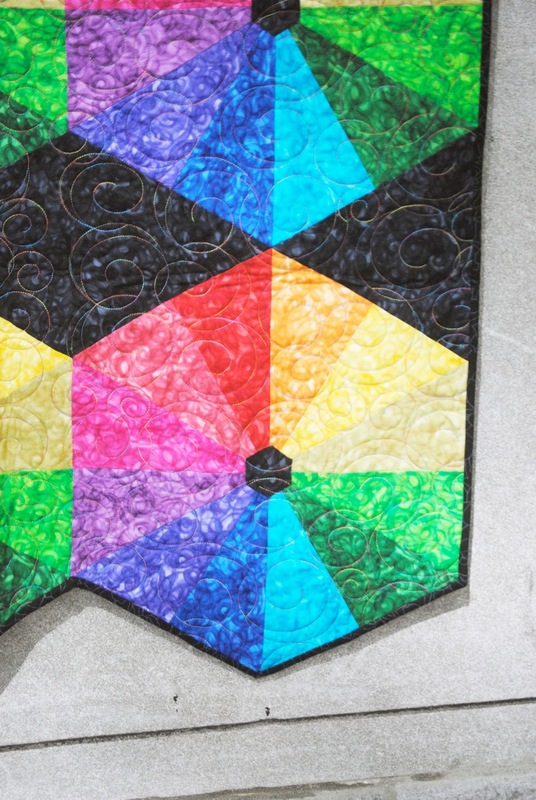 Love the rainbow tone-on-tone textures of Studio E.
I would do something similar as you....hexagons and wedges using the Night Sky pattern by Jaybird Quilts with this beautiful bundle. I would use them in making my blocks for do Good Stitches Nurture Circle! Yummy! I see some beautiful Dresden blocks used as flower heads with appliqued green leaves against a blue sky. I love your quilt! I would use the bundle to make a beautiful colorful quilt. i have a brand new little great-great nephew who NEEDS a quilt from these fabrics!!! Your quilt is so beautiful, if I won the fabric I would love to make your quilt! Love your quilt, and the colors are gorgeous! I love the bright colors…I am working on a civil war repro quilt, so I am ready to use brights again! What a gorgeous use of your bundle. That quilt speaks to me and says "make me". Thanks for the chance to win a bundle. I definitely would make your quilt. 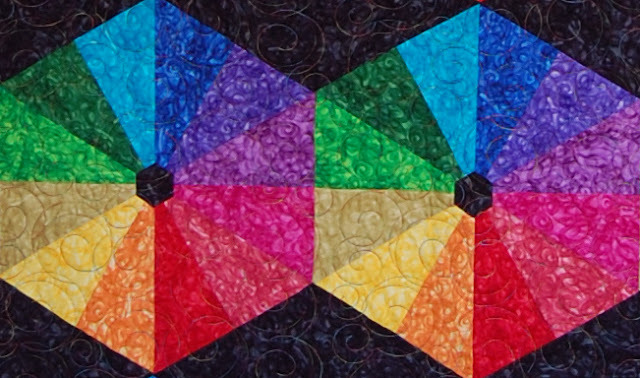 I'd use that fabric bundle to applique flowers on the border of my 3/4" hexagon quilt. They'd make perfect flowers!!!! I have been wanting to make a rainbow quilt and yours is great inspiration! I would make some sort of a rainbow quilt too, but probably not in wedges - maybe stars. But I am signing up for your newsletter, so I know when and if you release your pattern. I have been working with brights on a black background recently and love your quilt. I will use this to inspire my next project. Thanks for the giveaway! I think that bundle would make a great start for the Gravity quilt! I love the bright colors. Your quilt is great. I probably would us the fabric to make a baby quilt. I would make a baby quilt with all those bright colors. Gorgeous colours!! !id make a quilt but I'm not decided on the pattern. I love your Roy wedges!! I think I would make Tula Pink's Dreamweaver quilt with those beautiful prints. Beautiful jewel toned fabrics, my favorites! I would definitely make a quilt, preferably one of my own design. I have some ideas already! 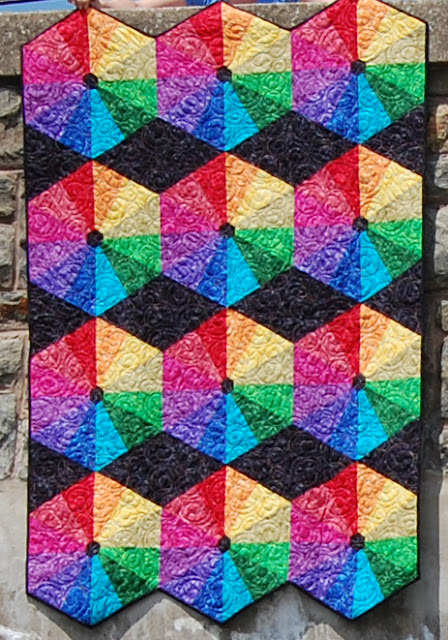 I love everything about this quilt and if I won I'd make a quilt with bright colors on black too! I also admire the fact that you kept the edges of the quilt following the design of the wedges instead of trimming them even. VERY NICE!! I'd love to sew a rainbow quilt with this colorful fabric! I really like the fusion line. Perhaps because my son loves all the colors in the rainbow right now or maybe just because they are pretty. I would make a star quilt I've been trying to find the right fabric for if I was the winner. I'm not sure what I would make but I can say it will be awesome just by using these great fabrics! Love them and your quilt! Modern Quilt Guild Webinar featuring Me!